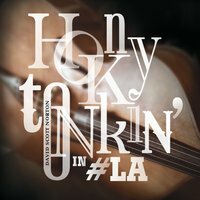 Thank you for your interest in my debut EP, Honky-Tonkin' In #LA. I hope it captures the joy I experienced playing music in California. This effort includes performances by prominent contributors to the vibrant country music scene I found in Los Angeles. Their interaction, impressive talent, and vast experience gave these songs their character and charm. I am truly fortunate for their participation and support. We found inspiration in the sound of the golden age of honky­tonk country. I attempted a fresh take on two old­school country classics: “I Can't Help it” and “I’m A One Woman Man”. The recording process, arrangements, and effects were chosen with the aim of creating a sound reminiscent of the period, but distinctly contemporary. The instruments were recorded with microphones, instead of digital inputs, so you may hear the spontaneity and singularity of each authentic performance. John Schreffler Jr. directed and engineered the recording at Fulton Manor Studios in Los Angeles. He also sang backup vocals, played rhythm and lead guitar, pedal steel, and lap steel guitars. John is not only a talented and energetic musician, but also a precise artist with impeccable musical ear. Tom Fillman created a contagious, energetic beat that served as foundation and set the tone for the album. Ted Russell Kamp contributed a soulful bass line that lingers in your head for days, as well as his elegant songwriting. We recorded two of his original songs: “Broke and Still Breakin” and “The Way Love Burns,” co­written with Wayne Buckner. Aubrey Richmond’s graceful fiddle helped integrate all these elements with charming harmony and clever musical dialogue. I, David Scott Norton, contributed the lead vocals, the production, and the catering. I hope you find this music refreshing and uplifting, and that it conveys the rich spirit of American honky­tonk tradition.